Includes table and eight counter height stools. Revamp the look of your dining area with the elegant and stylish Camila marble and black 9 piece counter height dining set from RC Willey. 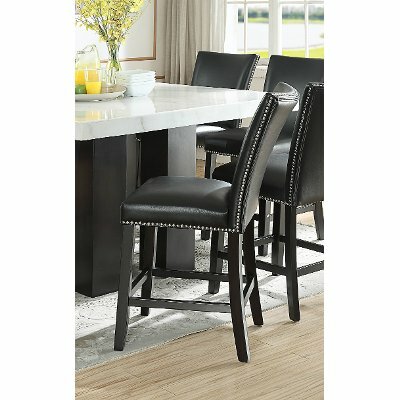 This dining set includes 8 black upholstered counter height stools which pair perfectly with the stark black table base and white marble veneer table top, making this dining set an effortless and gorgeous centerpiece in your home. Don't miss out on this comfortable and sophisticated black upholstered counter height stool from RC Willey. With its sturdy and sleek black legs, classy nailhead trim, and foam padded seat this chair will wow in every way and will look stunning in your home.